What makes homeowners love Petra Croton is its incredible coloration—deep green leaves with variegated, multicolored veins in bright red, orange, and yellow. 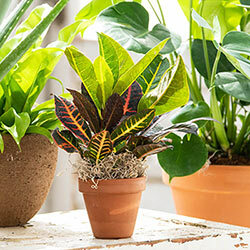 If you have room to fill, the Petra Croton houseplant will make that space shine, growing 6-8' high. You can also keep shorter by topping it in spring. This plant will only need water when the soil begins to dry out. Otherwise, it likes humid environments and an occasional misting of its leaves. Be sure to keep in a warm spot in the winter time, and be careful when moving it. Too much motion causes it to drop some leaves, but don't panic, just stick to the watering and lighting requirements and it'll bounce back fast. Petra doesn't only add mood-lifting beauty to your home. As it grows, it helps purify the air, too! Bloom Time Blooms in late spring-early summer. Flowers are very rare. Foliage Type: Green leafy shrub with multicolored veins in each leaf. Bloom Time: Blooms in late spring-early summer. Flowers are very rare. Flower Form: The flower is a single green vine with pink buds on it. The flowers turn white after blooming and look similar to allium. The flower can be cut off with no detriment to the plant. 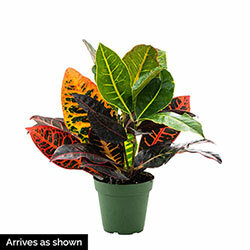 Planting Instructions: Re-pot when the croton's roots fill out the old pot. Soil Requirements: Do not let the soil be too wet or dry for extended periods of time. Pruning: Prune only unhealthy parts of the plant as they appear. Dead leaves or branches should be cut back to their respective bases. 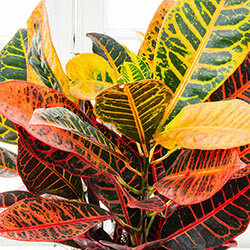 Winter Care: Keep the croton at temperatures above 60 F. Exposing it to those temporatures will make the plant lose some leaves and possibly kill it. Additional Information: Moderately toxic to pets and humans.